Create your registry for brides, grooms, everyday wishes and search for other registries here. Our staff can help you craft the right mix of everyday essentials and special heirloom worthy additions. Marcel’s is located in the heart of historic Glen Ellyn, Illinois at 490 Main Street. Welcome. Cook Create and Celebrate with us. 2014 Kitchenware Retailer of the Year and U.S. Global Innovator Award (gia) winner for independent kitchen retailers. There’s a class tailored to your palate, global curiosity and social schedule. Register today to reserve your spot in the kitchen and at the table. Plan a private event. Gather with friends, family or colleagues to celebrate the special milestones that make life and work meaningful. 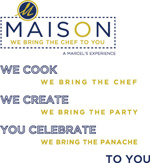 Maison – We Bring The Chef To You! Whether you’re planning a casual dinner party at home or a lavish affair for a large group, Maison is a great new way to elevate your next event with the experience you have come to expect from Marcel’s! Spend $50+ in Simon Pearce glassware thru 4/29th and receive complimentary engraving. From April 15th thru May 13th, purchase 7 pieces of dinnerware, glassware or flatware & receive the 8th FREE, to complete your set. It’s Easter week and yes, it’s SNOWING! Such is life in Chicago. Even though we anticipate one of Spring’s biggest holidays, we are not immune to the crazy weather that often comes this time of year. However we don’t let it stop us from Easter week preparations, as we decorate our homes and tables with colorful spring flowers and peruse recipes that highlight this season’s best! One way that can help make the transition to springtime cooking is our cooking classes. This week is the last week to take advantage of our Spring Class Sale*! Book any April or May cooking class through April 2st and get 20% off (use code: 20class). Our classes make great Easter gifts too. And speaking of Easter gifts, we have chocolates, cookies, and other tasty goodies to fill those Easter baskets. Not to mention, amazing 9 inch cheesy quiches from Marché that you can order, ready to warm and serve, $29.95 each. Choose between Fresh Asparagus with Spring Goat Cheese, Leeks and Herbs or Applewood Smoked Bacon with Rosemary, Gruyere de Comté and Parmigiano Reggiano. Order online or call (630) 790-8890. A reminder that both Marcel’s and Marché will be closed Easter Sunday (April 21st) so that our staff can spend time with their families. *Class sale does not apply to May 8th Ross MacNeill Fundraiser event or previous purchases. Cook Create and Celebrate at Marcel’s!